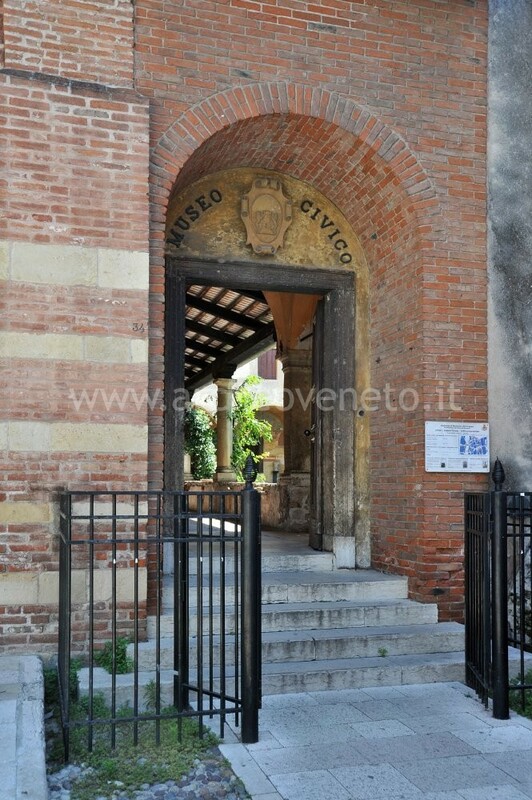 The archaeological section of the Civic Museum of Bassano del Grappa is situated in the former Monastery of San Francis, erected in the late 13th century/early 14th century together with its church. 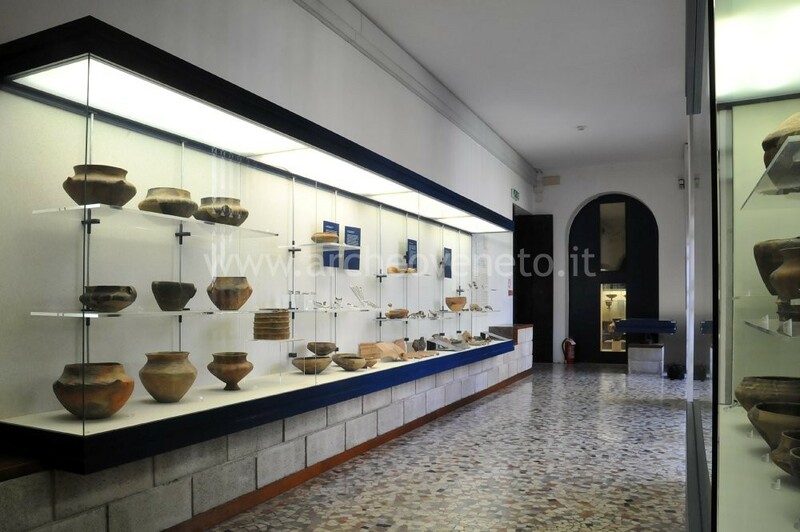 Besides a wide collection of Greek and Apulian pottery donated by Prof. Virgilio Chini, the Museum displays important Roman and pre-Roman archaeological findings that can be related to local populations. The museum also houses a naturalistic section, a rich picture gallery, a collection of Canovian documents and a valuable lapidary. The Civic Museum was founded in 1828 thanks to the donation made by Giovanni Battista Brocchi from Bassano del Grappa. The eminent naturalist left his scientific collection, a rich library and a large sum of money to the city in order to fund a public museum. In 1840 the public cultural institute was established and the collection, which had been growing over the years thanks to numerous donations, found its place in the building where it is currently hosted. As far as the archaeological section is concerned, it is the result of field walking and systematic surveys in the territory of Bassano. In 1978, the 600 vases from Magna Graecia donated by Virgilio Chini further enriched the collection. The room hosts most of Chini collection composed of about 600 ceramic artefacts from Apulia which help drawing the artistic and material culture of the populations (Dauni, Peucetii and Messapii people) who lived in the area between the end of the 7th century and the 2nd century BC and entered in contact with the Greek culture. In the first display case, on the right hand side of the entrance, some examples of vases imported from Corinth are displayed. They date back to 7th-6th century BC and are decorated with the typical zoomorphous frieze with black figures painted on a white background in an Oriental style. Pottery from Attica in black-figure style soon became dominant replacing pottery from Corinth. Great examples of kylikes decorated with miniature friezes, figures of knights, scenes of Dionysian dances and an amphora depicting a scene of Helen given back to Menelaus survived to us. In the next section of the display case, different types of indigenous pottery with geometric decoration from Peucetia (mid-6th century – early 5th century B.C.) are exhibited. Next to them, outstanding grave goods from the second half of the 6th century bear witness to the Greek influence on the local people. They are composed of a beautiful decorated Corinthian helmet, a Daunian dichromatic askos and three Attic lekithoi in black-figure style. A panel on the history of Apulia from Pre-history to the 5th century BC introduces the second large display case, situated on the left hand side of the entrance. The first ceramic artefacts are the most ancient examples of Apulian proto-Italiotic pottery, originally close to the Attic vase production, but which in the late 5th century-early 4th century BC departed from primitive models and acquired its own features, as witnessed by a Panthenaic amphora in red-figure style by Arianna Painter, a bell krater by Tarporley Painter and a skyphos from Lucania by Creusa Painter. Yet, the greatest example, in terms of quality and finesse, is the oinochoe by Pittore di Lecce which depicts several figures: an athlete with gymnastics equipment, an Aphrodite with Eros, a young satyr, an old Silenus with a flute and a youth boy with a strigil and a flute. 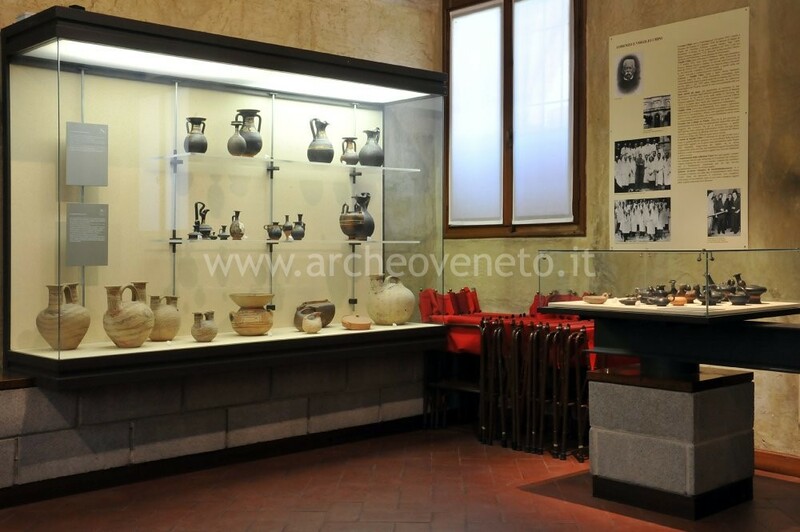 The last section of the display case contains red-figured vases made according to the Apulian tradition. They all depict Eros with Dionysus (including the situla by Chini Painter – mid-4th century BC). 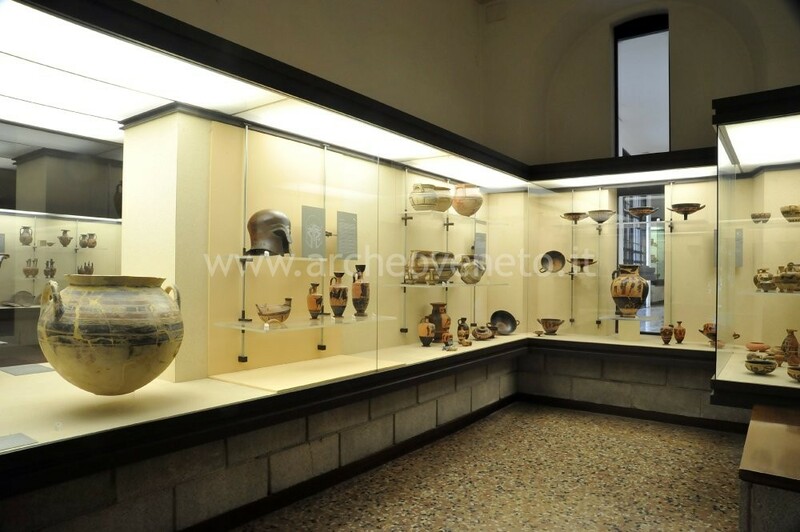 The following display case houses several examples of Apulian pottery in a plain and ornate style. The plain style was often used in small and medium sized ceramic artefacts (bell kraters) decorated with simple scenes. The ornate style was adopted in volute kraters and Panathenaic amphorae which depict funerary scenes or scenes from the mythological-theatrical world. In the middle of the room there is an hydria with plaques, possibly from the Messapian Oria dating back to the last quarter of 4th century BC. Its names is based on its decoration consisting of applied reliefs (stylized lotus flowers, branches of ivy and mythological figures) on a black background which imitate the highly celebrated metallic vases of that time. The visit to the museum continues with the last large C-shaped display case situated along the right wall. It contains further examples of black-figured pottery imported from Attica dating back to the 6th century BC (including a column krater depicting Dionysus among satyrs and maenads by Lydos Painter) and monochromatic geometric pottery from Peucetia. The Daunian geometric ceramic artefacts (7th-5th century BC) displayed also hold great importance. They include dippers with depictions of water birds and human figures, jars, oinochoi and askoi, mainly from three centres of production, namely Ascoli Satriano, Ordoli and Canosa. Noteworthy are also the typical Messapian trozzella vases decorated with vegetal and geometric motifs. This style reached its peak between the 5th and the 4th century BC. Besides a few examples of Attic red-figured pottery from the 5th century, this display case contains a large number of Apulian pottery in red-figure style from 4th century BC, including a pelike with a wedding scene and a column krater depicting a warrior offering a kantharos to a woman. The last example of pottery is the mixed style pottery, influenced by the Greek colonies in the Ionic region and featuring stripes and naturalistic lines. This style developed all over Apulia in 5th century BC to respond to the demand of customers keen on the Greek artistic influence. In the last section of the room three panels describe the history, archaeological finds and artistic traditions of Apulian populations. This small room houses other artefacts from Chini collection. It contains pottery from Apulia, about twenty terracotta figures, a numismatic collection and an unusual set of bronze objects from Iran. The first display case on the right hosts numerous Gnathia-style pottery (4th century BC), named after the excavation site where they were first found, marked by a surface with polychromatic graffiti on a black background. In the second display case more recent Gnathian-style ceramic vases (3rd century BC) with a pod-shaped decoration are displayed. Furthermore, it contains ollas and askoi in banded ware from Canosa (second half of the 4th-3rd century BC), whose distinctive features are their vertical or horizontal bands. The visit continues with three small display cases. The first one contains gutti (vessels for oil and ointments painted in black) and terracotta lamps from 4th-2nd century AD. The second and third display case house different types of terracotta figures (mid 5th-3rd century BC). The numanistic collection includes a large number of coins, from Greek and Magna Graecia mints as well as Imperial Roman mints, spanning from 4th century BC and 498 AD. A whole display case is devoted to precious golden and amber personal adornments (fibulae, bracelets, necklaces and earrings) from Apulia and Macedonia, part of Chini collection. The last section of the room houses the “bronzes of Luristan”, as Chini himself named them, dating back to 2nd millennium BC-7th century BC. They can be grouped as follows: objects from mountain people, including daggers and arrowheads (first and second display case) and religious objects from the same population who settled in the plain, which include animal-shaped earrings and disc brooches (second display case). 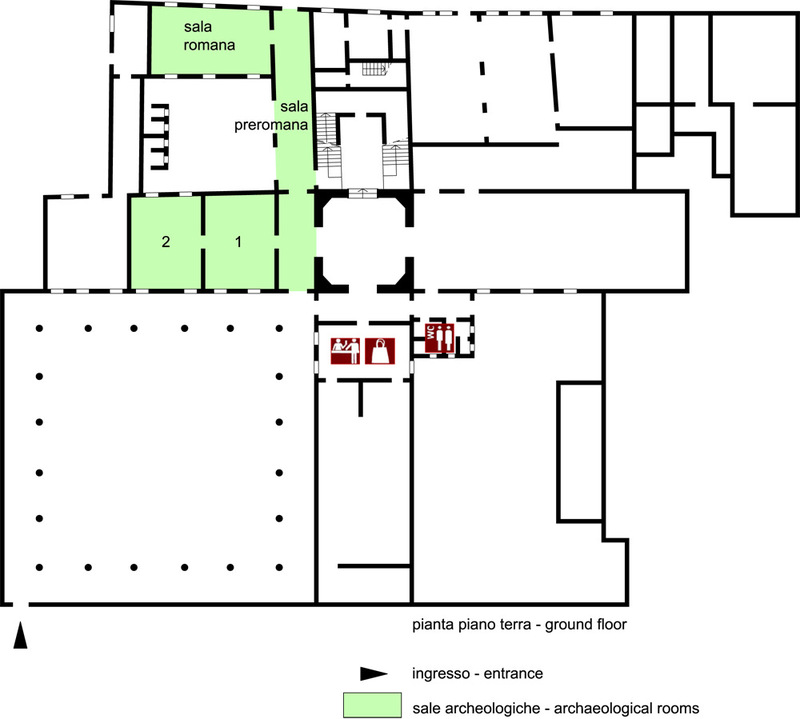 In this room, Pre-historic and Proto-historic finds discovered in the area of Bassano thanks to field-walking and systematic surveys are exhibited. The visit starts with the exhibition of numerous flint tools grouped according to their shape, size and sites where they were found which include Mussolente-località Castellaro, Pove, Marostica-località Erta and Piazzette, San Zenone-Case Beltramini, Bassano-località Boschetto. A large panel introduces the pre-roman section. It describes the developments occurred in the area around Bassano from the Middle to Recent Bronze Age (16th-12th century BC) when settlements became widespread. 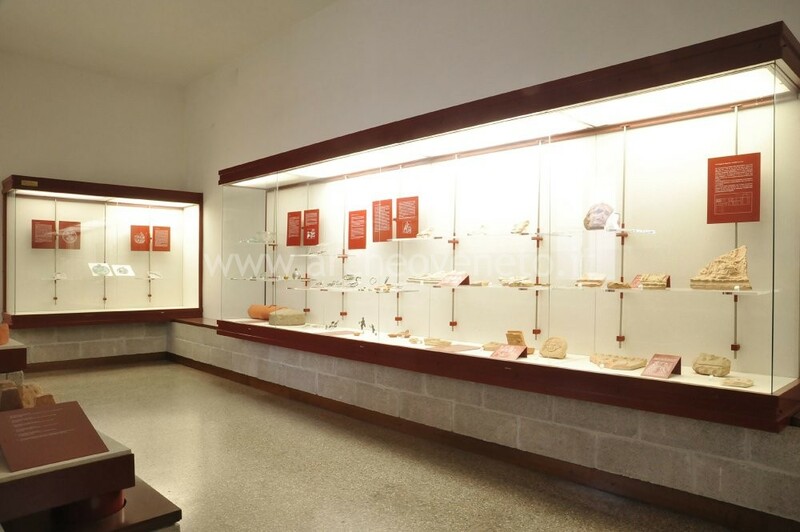 The first section of the large display case on the right contains artefacts from two small villages erected in hilly areas in the Middle Bronze Age and linked to larger villages in the plain, namely Liedolo-colle San Lorenzo and San Giorgio di Angarano. A large quantity of domestic pottery in coarse clay (ollas, strap or rod-shaped handles, large bowls, dolii and biconic vases), some moon-shaped or truncated horn-shaped handles, spindle whorls, fictile washers and a flint arrowhead come from Liedolo-colle San Lorenzo. Ceramic vessels for domestic use, such as ollas, dolii and large ribbed cists with large knobs are from the older village of San Giorgio di Angarano (Recent Bronze Age) which features elements of the sub-Appennine culture. In the late Bronze age, the village was moved southward in a hilly terraced area, where terracotta ware for cooking and eating as well as a decorated bronze fibula were found. In the second section of the large display case and in the other one (on the side and in the front) artefacts from the necropolis of San Giorgio di Angarano are exhibited. They date back to a time span ranging from the 11th to the early 8th century BC. The large display case houses typical male grave goods (pins, razors, twisted bow fibulae) and female grave goods (spindle whorls, simple bow fibulae with different types of decorations, armillas, hairpins and small rings) on one side and urns with the ashes of the cremated body (bowls, big cups with knobs, ribbed cists, biconical vases, truncated-conical large bowls and ollas decorated with grooves and cups to cover them) on the other side. The following display case houses grave goods from late Bronze Age (11th-10th century BC) from the same necropolis of San Giorgio di Angarano. The most significant graves are grave no. 70 (female grave), with a fragment of biconical cinerary vase, a torc and a small fibula and grave no. 11 (male grave), with a large biconical urn on a low foot, a pin and a razor. They share the same features as the artefacts displayed in the previous display case, but they date back to the second phase of the necropolis (early Iron Age). An exhaustive example of grave goods from this period can be seen in grave no. 33, which contains a large truncated-conical cinerary cup, a cup to cover the urn and an enlarged bow fibula with geometric decorations. In the same display case there are artefacts from the Iron Age (8th-4th century BC) bearing witness to the presence of ancient Veneti people in the area of Bassano, including fragments of pottery, a trapezium-shaped votive tablet with embossing decorations, a “Certosa”-style fibula, a flanged axe from Romano d’Ezzelino and numerous types of fibulae as part of grave goods discovered near Borso del Grappa-località Cassanego. This room is dedicated to archaeological finds from the Roman Age, as a result of isolated field walking in the northern part of the plain, south of Bassano. A broad map of the area of Bassano shows where specimens were found and the typology of each place (village, sacred site, necropolis, etc.). In the middle of the room there are fictile objects from a Roman building material plant situated near San Giorgio di Angarano used to produce ceramic building material and terracotta wares. In front of them there is a large display case which houses architectural terracottas, metallic materials and glasses, probably from the country villas scattered in the area. The architectural terracottas (Campana slabs, crowining slabs, simas and antifixes) are all from San Giorgio di Angarano and date back to Augustus Era. They offer an exhaustive picture of the wide range of decorative motifs used: scenes from the epic world (Apollo playing the cithara, Nike performing a sacrifice, Bacchus) and simple vegetal motifs (small palm trees, branches, achantus tufts and spirals). Metallic materials include a P-shaped fibula from 1st-3rd century AD, a crossbow fibula from 3rd century AD, an armilla with a snakehead-shape decoration from Bassano, Borgo Margnan (fondo Rigoni), several armillae, a bronze key from 1st-2nd century AD, a bronze figure representing Mercury found near a “Firmalampen” lamp from Angarano and a bronze figure representing the winged victory from 1st-2nd century AD. Noteworthy is the hideout discovered in Mussolente with 117 sesterces dating back to 90-96 and 183 AD. The last section of the display case houses glass material of uncertain origin dating back to the 1st-4th century AD. The following display case exhibits two extraordinary engraved bronze discs, possibly from sanctuary areas. The first one, Rosà disc, named after the place where it was found, shows two facing figures, probably a man and a woman and dates back to the second half of the 1st century BC-mid 1st century AD. The other one, Marostica disc, dates back to 3rd-1st century BC and is articulated in three registers: four male figures in profile perspective with weapons, shield and helmet in the upper register; four armoured male figures in frontal perspective in the middle and two cows in the lower register. A sacred object (simpulum) found in the same area supports the idea of the sacred function performed by these discs. The last display case houses swords and other metallic objects used by Longobards. Passamani B. 1975, Guida al Museo civico di Bassano, Calliano , pp. 10-17, 19-21. Andreassi G. 1979, Ceramica italiota a figure rosse della collezione Chini del Museo Civico di Bassano del Grappa, Roma . Rossi F. 1981, Ceramica geometrica apula nella collezione Chini del Museo civico di Bassano del Grappa, Roma . Andreassi G., Labellarte M., Maruggi G.A., Patera A. 1990, Ceramica greca della collezione Chini del Museo Civico di Bassano del Grappa, Roma . Andreassi G., Bonomi S., Bianchin Citton E., D’Amico A., Dell’Aglio A., Fozzer S., Labellarte M., Leone C., Lippolis E., Salvatori S., Tarditi C. 1995, Ceramica sovradipinta, ori, bronzi, monete della collezione Chini del Museo Civico di Bassano del Grappa, Roma . Musei e raccolte archeologiche del Veneto 2004, a cura di Di Mauro A., Dosson di Casier, pp. 137-139. Bonetto J. 2009, Veneto (Archeologia delle Regioni d'Italia), Roma, pp. 372-375.